The idea of sending flowers may seem expensive, but the peeps at Happy Bunch are here to make it a lot more affordable. At just $35, you can now send flowers (and love) someone's way! The concept at Happy Bunch is simple - a new bouquet is launched every evening and you can order it for delivery on the next day. They also have an option for an upsized bunch, which means you can get a fuller, bigger bouquet - just in case the occasion calls for one! The option allows you to double, triple, quadruple or even quintuplet your bouquet, with the regular ones starting at just $35! If you are all in for surprises, you can even pre-order a bouquet (not knowing what kind of florals you'll be getting), and have it sent to that special someone! Their floral arrangements change from day to day by picking the freshest seasonal flowers and putting them together. They are all wrapped in a rustic burlap for that extra-Instagram worthy look! I love how they use seasonal blooms and how they never repeat what they have put out before. The freshness of the bouquets are also guaranteed - they sent two to me previously and both of them lasted for more than 4 days! 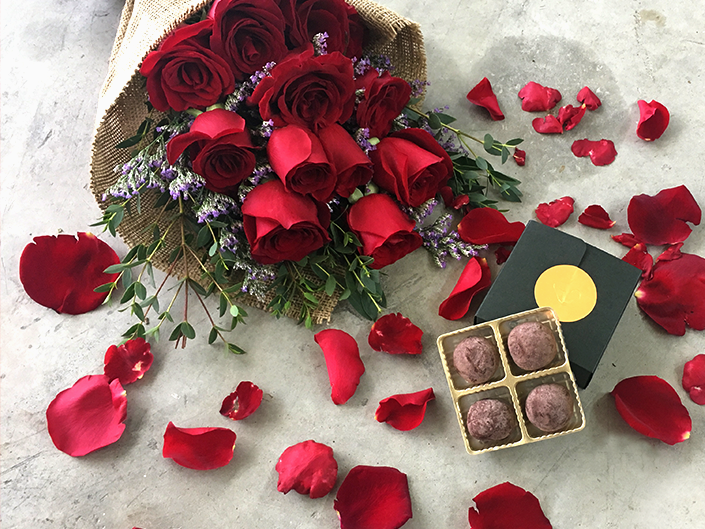 This Valentine's, you can send a bouquet paired with Truffle Chocolates, with pre-orders starting at just $79 - pretty affordable for Valentine's Day in my opinion. For more information, visit www.happybunch.com.sg or follow them on Instagram at @happybunchsg! This was a media drop from Happy Bunch Singapore.